Flavor text Nature says “do not touch” in so many creative ways. 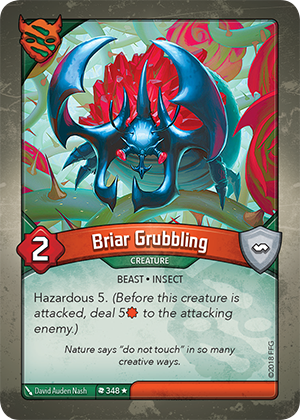 If Briar Grubbling is attacked by a creature with the Skirmish keyword, does attacker take damage from the Hazardous effect? Yes, Hazardous damage can be used to harm attacking creatures with the Skirmish keyword. The Skirmish keyword only protects an attacker from damage during a fight (i.e. when damage from creature power is exchanged), and doesn’t prevent damage from other sources, such as other keywords or card abilities. If Hazardous damage – which takes place before a fight – destroys a creature, the fight does not occur.